To question one’s government – at least in the more “advanced” nations of the world – is often labeled as unpatriotic and ignorant. Government has been morphed into an entity towards which most people turn in times of strife and uncertainty. The common cry is for the government to “do something” in order to fix the perceived troubles. From natural disasters and environmental cleanliness to unemployment and economic health, people tend not only to believe that it is the job of government to meddle in these affairs but more incredulously that government can even do anything about these situations. A generally unbiased review of past performances by government in the handling of various social problems presents to the historian a nearly perfect record of failure and inefficiency. To quote a political player whose actions betrayed his words, “government is not the solution to our problem; government is the problem” (emphasis in original). The next logical question then becomes in which manner is it most effective and equitable to the people involved to alter the government. To this question I say let every individual choose for himself. People are quick to point out that if individuals were allowed to choose their own political construct that the world would be in chaos and anarchy, the markets would come to a screeching halt and that the old adage “might makes right” would become the way of life. It is interesting to note that so-called advocates of freedom would make this statement regarding the decision to allow an individual to choose their own future. It is generally only in the construct of an established government that one is so close-minded to allowing individuals the freedom of choice. It is also interesting that so many people have such little respect for human dignity that they would suggest the only thing keeping humans from being savage animals is the threat of violent retaliation by a government. The idea of peaceable human interaction is a foreign concept to these people. The fact is, there is plenty of evidence in everyday life which points to the ability and desire of free individuals to interact voluntarily and peaceably with their fellow man. Another excuse for government control is that it is a widespread and effectively universal phenomenon. “Get used to it,” they say. Serfdom and slavery were worldwide phenomena a few hundred years ago, should they have “gotten used to it” as well? The state of technology and standard of living has been progressing throughout the entirety of human history, yet we are supposed to believe that the political system we have been living under for the last 200 years is perfect? Why should we not expect the social system to progress as well? And I’m not referring to the amendment process or the ability to pass new laws or the alleged ability of voters to replace all of the elected officials because none of these fundamentally change the way the system works. The specific workings of the political system do not require tweaking, the entire system itself is in need of replacement. The current system – whether it was intentionally designed this way or not is irrelevant – is greatly biased to incumbents and those involved in the primary political parties. For example, when he ran for president in 1988, Ron Paul spent $500,000 – 25% of his entire budget – just to satisfy the legal requirements to get on the ballots and even still didn’t get on the ballots of four states. (And to kick a dead horse while it’s down, this would be nearly $1 million in today’s dollars, yet another telling failure of the current system.) Those currently in power have every incentive to remain in power at the expense of people outside his district as well as those in the future. If nothing else, Congress is amazingly successful at keeping itself in office. 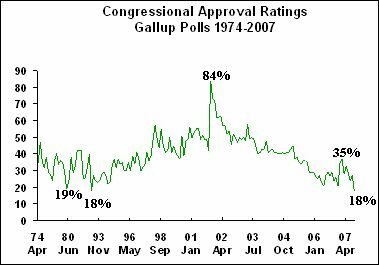 Polling data show that over the vast majority of the past forty years, rarely does congress experience an approval rating even marginally close to a majority of citizens. By this evidence alone we should expect to see re-election rates to be equally abysmal. As the following charts display, however, the incumbent is almost never ousted in the House of Representatives (which one would think ought to have a high turnover rate with terms of only two years) and only rarely in the Senate. If, then, it becomes necessary to dissolve the political bands currently enslaving them, how best is this achieved? We can see that it is next to impossible to make changes through the current system if one expects to increase individual freedoms. The idea of secession was “solved” during the Second American Revolutionary War (a.k.a. American Civil War) or so many like to believe. Many will point out that the only methods available to change the government are found within the Constitution. However, this begs the question of the Constitution’s validity to begin with. This is the topic of a future discussion.